It all started with Proton claiming that the Persona facelift – previewed earlier this month – has on average, 32% lower servicing costs compared to the Perodua Bezza and Honda City, over five years/100,000 km. It didn’t take long for Perodua to hit back. “The inaccuracy in cost difference is due to a comparison made not on an apple-to-apple basis. The Persona’s service costs were calculated as scheduled in its service booklet or owner’s manual whilst for the Bezza, the calculation was based on its preventive maintenance costs (which are optional) instead of scheduled costs as recommended in the service booklet,” said Datuk Zahari Husin, MD of Perodua Sales. P2’s sales chief added that the difference in maintenance costs between the Persona 1.6 AT and Bezza 1.3 AT is only RM44, or 1.4% in favour of the Proton, and not 32%. It was also pointed out that the Bezza uses 0W-20 motor oil (Persona uses 10W-30) and iridium spark plugs, which are costlier than regular items. So, is the difference 40%, 32% or 1%? Now that we have in our hands on the itemised service schedule from the Bezza’s owner’s manual, the picture is clear. Unlike Proton, Perodua has a Pro-Care preventive maintenance package for the Bezza that’s optional. Items on the Pro-Care menu is not strictly required as per the owner’s manual/service booklet, and opting out does not affect the car’s warranty. As shown in the chart above, the difference between opting for all Pro-Care items and strictly going by the (service) book is not insubstantial for a budget car – RM4,287 versus RM3,095 for a difference of RM1,192 over five years. RM3,095 is the apple that P2 wants us to see next to the Persona’s RM3,051, and the difference is indeed a mere RM44, or 1.4%. However, if you just nod and say yes to everything (the full Pro-Care preventive maintenance package on top of the mandatory service menu), the difference between the Bezza and Persona becomes RM1,236. That’s 40% more. With that said, let’s take a closer look at the optional Pro-Care package and what it entails. Mainly, it’s shorter interval for selected items such as spark plugs, engine air filter and brake fluid. For instance, the 100,000 km spark plug change is in the owner’s manual, but there’s a Pro-Care optional change at 50,000 km. Similarly, mandatory brake fluid and air filter changes are set at 40,000 and 80,000 km in the service book, but Pro-Care recommends changes at every 20,000 km (which means these items pop up for your consideration at 20,000 and 60,000 km). In addition, Perodua also offers tyre alignment, balancing and rotation (every 20,000 km); and a major air con service at 60,000 km as part of the Pro-Care package. If you skip the tyre and AC jobs and just tick the brake fluid, air filter and spark plug options, the difference between Pro-Care and standard is RM823. 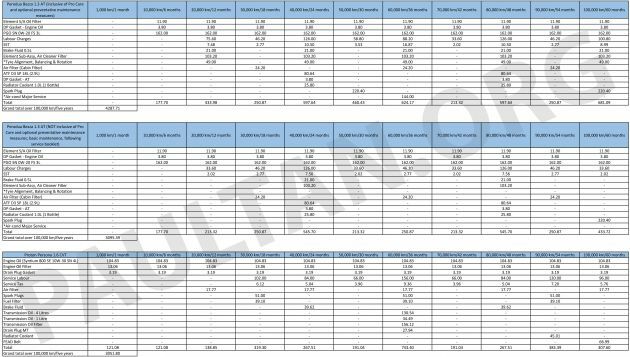 So there you have it, the difference in five-year/100,000 km servicing costs between the Bezza 1.3 AT by the service book, the Bezza 1.3 AT with the Pro-Care optional maintenance package, and the Proton Persona 1.6 AT – itemised. Those who rack up lots of miles (the Bezza is popular with Grab drivers) might want to consider Pro-Care suggestions, but forgoing them will not affect the car’s warranty – the choice is yours. Note that the Pro-Care optional items are all listed on Perodua’s website (asterisk marks out the options) and included in the total price for the selected interval – those were the official figures that we used for earlier comparisons (Proton also used the same source, it confirmed). Do look out for these optional items at the service centre, and specify that you want to follow the standard menu (owner’s manual), if you wish. By the way, Proton does not offer any optional service items. In any case, there’s more to overall running costs than just servicing costs. There’s road tax and annual insurance, and of course, fuel consumption. The Bezza 1.3 uses a modern Dual VVT-i engine from the NR family, which is used in various current Perodua/Daihatsu/Toyota models. 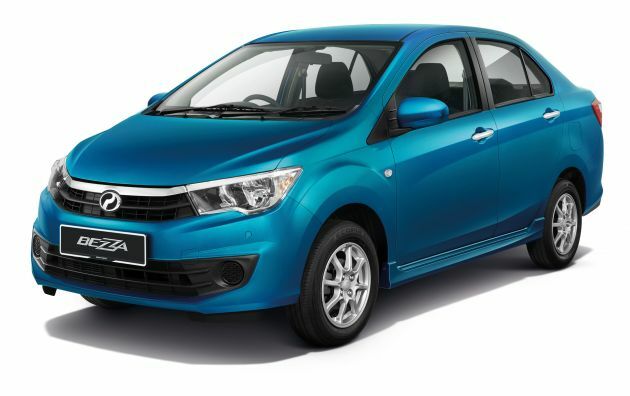 Paired to a four-speed automatic, the top Bezza Advance model’s claimed FC is 22.0 km/l, thanks to the inclusion of Eco Idle automatic start-stop. Read more about the engine and its internals here. The post Perodua Bezza servicing costs: just 1% or 40% more than the Proton Persona? The numbers explained appeared first on Paul Tan's Automotive News. 0 Response to "Perodua Bezza servicing costs: just 1% or 40% more than the Proton Persona? The numbers explained"